Quickie with a 100HP Diesel Engine! In 1974, Tom Jewett and Gene Sheehan decided to begin designing an airplane that would provide "more flying enjoyment for less money" than other homebuilt aircraft designs popular at that time. Burt Rutan (Rutan VariEze and Voyager, see NASM collection) assisted Jewett and Sheehan in the design work and the first Quickie was finished, tested in flight, and ready for a public introduction by April 1978. In June, the two men formed the Quickie Aircraft Corporation to produce and sell complete kits to build the aircraft. 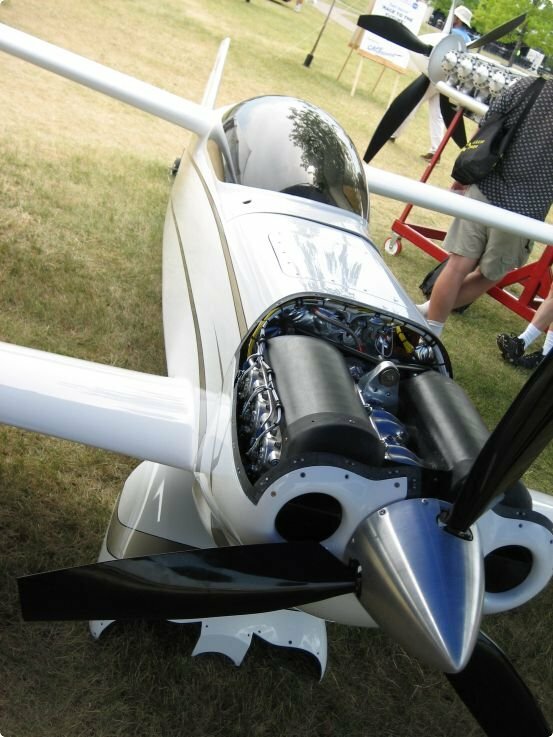 They flew the airplane to the Experimental Aircraft Association's annual gathering at Oshkosh, Wisconsin, in June where the Quickie drew intense public interest and won the Outstanding New Design award. By 1980, the firm had sold 350 kits. The Quickie is a single-place, single-engined aircraft fitted with a canard approximately equal in area to the main wing. The layout almost qualifies the aircraft as a biplane with tremendous negative stagger between the upper and lower wings. Construction methods remain identical to other Rutan designs. A builder cuts foam cores for the various components and covers them with resin and fiberglass cloth. Rutan envisioned powering the Quickie with an Onan industrial generator engine that developed 22 horsepower but many builders found this motor too weak.